This Digital Fully Automatic Egg Incubator is the easy answer to hatching eggs. This simple and reliable egg incubator is the fun for the family and household that wants to start incubating chickens, ducks and geese. The easy design and functions allow kids to learn the basics of incubating eggs. This incubator is so easy to use, the only thing you need to do is just add eggs. 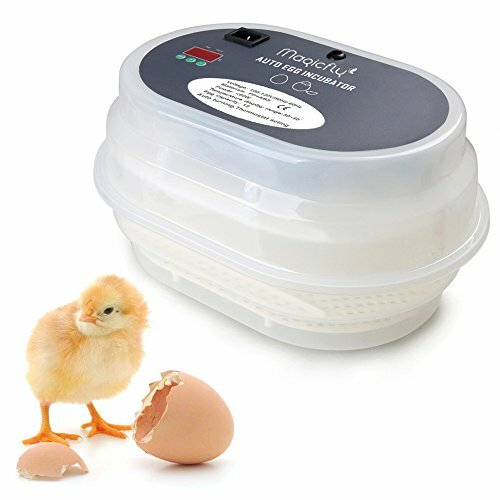 This egg incubator features solid molded construction and all the built in electronics you need, to which automatically control temperature, rotate eggs and it also comes with a humidity alarm to warn you if there was any mishaps with the chicks. The incubator is packaged with full LED displays, you can rest assure that they are in safe hands. Note: It is invisible to see the turner work, but it did turn and work, please do not worry. And you don't need to turn the eggs manually. 1. Unpack the box and check the incubator, check whether all of the accessories inside of the packing box are well-equipped. See packing list for details. Automatic egg turner, (note: It is invisible to see the turner work, but it did turn and work, And you don't need to turn the eggs manually.) It can hatch chickens, ducks, fowl and geese,etc.